Erdogan's message for April 24, memorial of the "Great Evil" . The document does not acknowledge any responsibility, but expresses support for historical research and talks about "our shared future”. 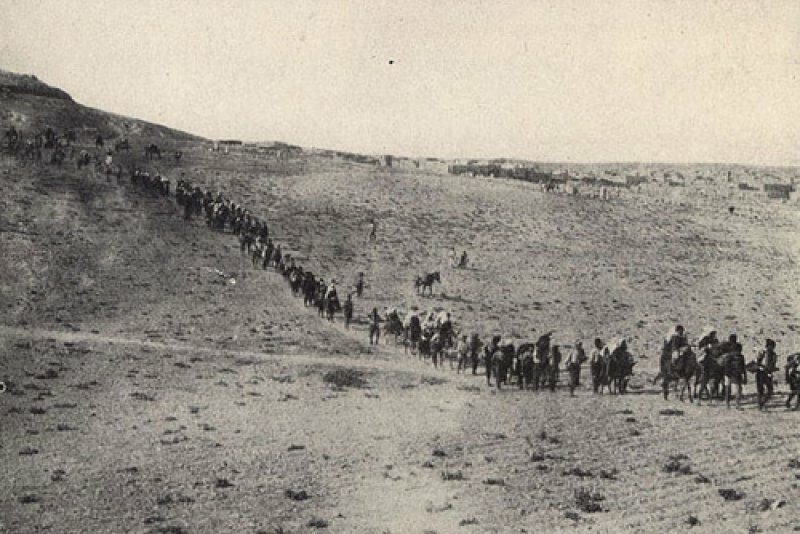 Ankara ( AsiaNews) - For the first time the Turkish government has presented its "condolences" to the descendants of the Armenians for the "suffering" of the "difficult period" of the last years of the Ottoman Empire. The message by Turkish prime minister, Recep Tayyip Erdogan, begins with the affirmation that April 24 "has a special meaning for our Armenian citizens and to all Armenians of the world". The reference is the day on which "the Armenian genocide" is commemorated, the deportation (pictured) and the extermination which the Armenians call "The great evil" of hundreds of thousands of men, women and children belonging to the ethnicity, motivated by the fear that they wanted to help the Christian Russian Empire, and side with the enemies of Turkey. Erdogan's message - despite being significant - never uses the term genocide, which Turkey absolutely denies. Instead it likens the stories of Armenians to those of "Turks, Kurds , Arabs " and "millions of other Ottoman citizens" and expresses openness to historical research together with a rejection of responsibility of modern Turkey and an invitation to dialogue. In particular, the past should not prevent Turkish and Armenian people "humane attitudes among towards one another". "Millions of people of all religions and ethnicities lost their lives in the First World War". "To evaluate this painful period of history through a perspective of just memory is a humane and scholarly responsibility". "In Turkey, expressing different opinions and thoughts freely on the events of 1915 is the requirement of a pluralistic perspective as well as of a culture of democracy and modernity". And even if "some may perceive this climate of freedom in Turkey as an opportunity to express accusatory, offensive and even provocative assertions and allegations," Turkey reaffirms openness and support for a historical examination of the events of that time. The "episodes" of the First World War are "our shared pain". "To evaluate this painful period of history through a perspective of just memory is a humane and scholarly responsibility". But "in today's world, deriving enmity from history and creating new antagonisms are neither acceptable nor useful for building a common future". "The people of Anatolia, who lived together for centuries regardless of their different ethnic and religious origins, have established common values in every field from art to diplomacy, from state administration to commerce. Today they continue to have the same ability to create a new future".